It's the first track from Bloodbath's new album! 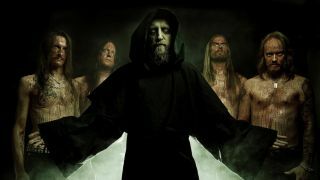 Passionate advocates of the true spirit of death metal, Bloodbath have appeared in various incarnations over the years, with Opeth's Mikael Akerfeldt and Hypocrisy's Peter Tagtgren performing vocal duties at various points along the band's gore-drenched career path. In 2014 it is Paradise Lost frontman Nick Holmes that has stepped up to the mic, reviving his legendary unearthly growls for new album Grand Morbid Funeral, which sees the grim revivalists dragging their sound ever further back into extremity’s filthy shadows. The first song to be released from Bloodbath’s repulsive new opus, Unite In Pain is a masterclass in feral riffing, unholy howls and exhilarating, abyssal heaviness. Play it loud and may God have mercy on your festering soul. Pre-order the album and bundles from O-Merch or the Peaceville Store now.